Heat oven to 425°F. Place 1 pastry round or pie crust in 9-inch glass pie plate. In large bowl, mix sugar, flour and orange peel. Stir in rhubarb. Spoon into pastry-lined plate. Cut butter into small pieces; sprinkle over rhubarb. Cover with top pastry or second crust; seal and flute. Cut slits in several places in top crust. Cover crust edge with pie crust shield ring or strips of foil to prevent excessive browning. Bake 50 to 55 minutes or until crust is golden brown and juice begins to bubble through slits in crust, removing foil during last 15 minutes. Cool on cooling rack at least 2 hours before serving. Substitute 2 bags (16 oz each) frozen unsweetened rhubarb, thawed and drained, for the fresh rhubarb. Substitute 3 cups sliced fresh strawberries for 3 cups of the rhubarb. Use 2 cups sugar. Rhubarb is very tart, so there’s a lot of sugar in this pie. Use the lower amount of sugar for young, thin rhubarb stalks. Rhubarb, originally from china, was once considered a vegetable, but because of its modern applications in baking is treated and categorized as a fruit today. Some nutritionists even consider rhubarb a superfood due to its low caloric content and its high levels of calcium. Even better, it tastes spectacular in desserts like pies, cakes, and crisps. It’s easy to see why this scratch-made rhubarb pie is a classic with its sweet and tart flavor and buttery crust. If you’re short on time, you can add this filling to a ready-made pie crust, but we recommend making a homemade pie crust — it’s worth the extra effort, we promise! Still have a bundle of rhubarb left in your garden? 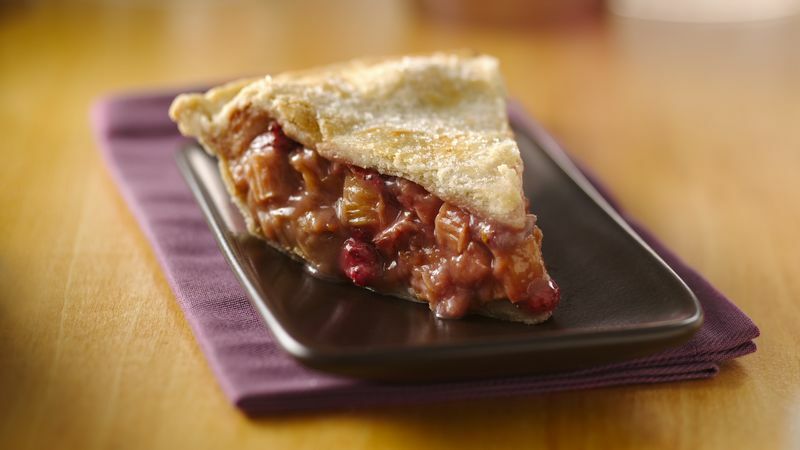 Not to worry, Betty’s got even more rhubarb pie recipes for you to try next!